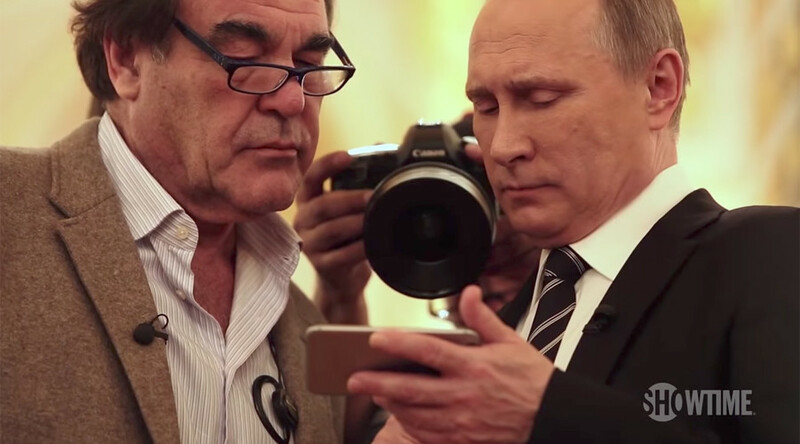 Renowned US director Oliver Stone has urged the media "not to trivialize" his documentary on Russia's President Vladimir Putin, after allegations emerged online suggesting that Putin showed Stone an American attack video while passing it off as part of Russia's military campaign in Syria. "He brought out a phone and he showed it to us, we filmed it and he said this was that. Why would he fake it?" Stone said at a press-conference during the Starmus science festival in Norway. "I mean, the Russians did very well in terms of damages to ISIS in Syria, they bombed the s*** out of Syria and they did destroy the financial ability of the ISIS empire... I think that was the main point," the director commented. On Tuesday, allegations emerged on social media claiming that in one instance, the Russian president is seen showing a "fake" video on a smartphone to the director. Putin was talking about Moscow's anti-terrorist operation in Syria, but showed footage that, as social media users alleged, was of US Apache helicopters attacking Taliban fighters in Afghanistan. On Wednesday, the issue was put to the director by a journalist from Norwegian Broadcasting Company (NRK), "There is a Russian blogger who says that [the video] is fake... What you say to that?" Stone appeared to be annoyed rather than startled with the question. "Listen, are you gonna start with this blogging bulls***? The bloggers say this, the bloggers say that, we are gonna be here all day... Are you gonna start into specific footnotes or what," he rebuked the reporter, asking the media to engage "constructively." The reporter went on to suggest that such kind of response to the director's work might demonstrate a "tendency in the media or used by other people to distract [attention] from real problems." "Yeah! It's a four hour documentary, complete interviews, it was on in the United States, England, Germany, it's going on in France, Russia, it's having some impact, and it allows him [Putin] for four hours to speak in Russian to a Western audience, which has never been granted to him," Stone said. 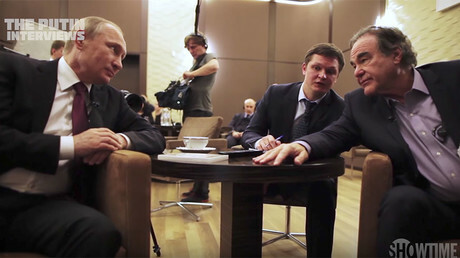 Stone’s documentary spans many hot issues, such as "the American expansion of NATO, the American support of terrorism in central Asia," Syria, Ukraine and nuclear weapons, the director added. It covers "numerous subjects, and this guy starts with – no insult, but I mean you are starting with a detail! There are some big issues covered in this thing, don't trivialize it!" The four-part special documentary project, 'The Putin Interviews,' has got quite a response, the American director said, adding, that he has also received "quite a bit" of feedback from the Kremlin. His project has been criticized in the US, Stone said. "As you know, in America they are hearing stuff they've never heard. I love it when they say, 'This is all boilerplate Russian talk'... Anyway, the West is very divided, as always, they would hate me. I'm just a messenger, I don't take an opinion, I don't take stance. I'm enabled to shoot this documentary because of my reputation [and] I do think we had a good dance," Stone told RT at the press-conference. "I think the camera doesn't lie, the camera tells you things in body language, eyes, that you can't quite feel sometimes from just words," he added. On Wednesday, the Kremlin also weighed in on the “fake video" allegations, describing it as "wrong and inappropriate." The footage shown by Putin to Stone belongs to the Russian Ministry of Defense, Putin's spokesman Dmitry Peskov told reporters. He said it was part of the military's report to the president on the situation in Syria, and was shown on a smartphone belonging to "one of the employees."